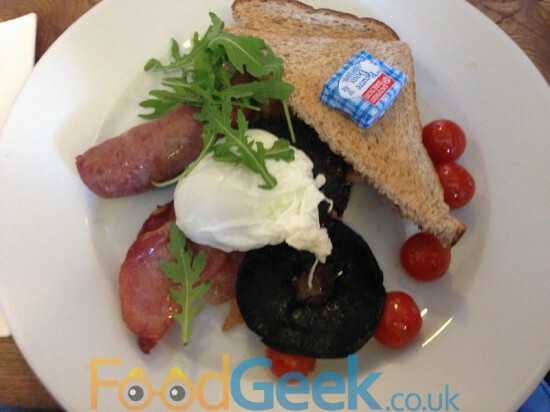 Being rather partial to a cooked breakfast, especially the morning after a big night out and knowing that Saturday night would be just that, I spent some time looking into where to eat breakfast in Glasgow on Sunday morning. One name kept cropping up again and again, Cafe Gandolfi. 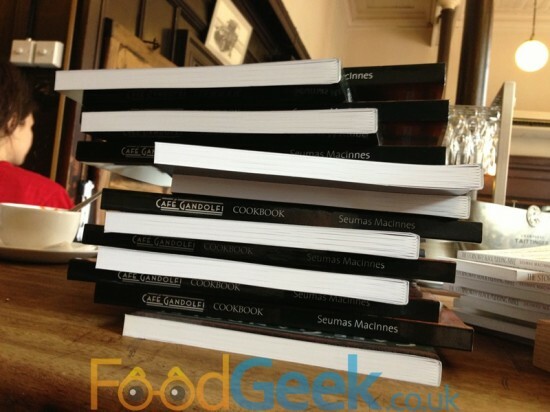 It’s been around for over 30 years and appears to be hugely popular and well loved, the current owner Seumas MacInnes even has a couple of impressive sounding cookbooks to his name. It was quite a walk from my hotel and as I passed many perfectly adequate looking cafes along the way I wondered if it would be worth the effort. Turning onto Albion Street we walked past ‘Gandolfi Fish’, ‘Gandolfi Fish To Go’ and ‘Bar Gandolfi’ before arriving at ‘Cafe Gandolfi’. Perhaps Gandolfi Street would be a more appropriate name! Thankfully i’d made a reservation as it was almost completely full, they just about had room for us at a small table where we ordered a couple of pricey but very nice freshly squeezed orange juices whilst deciding what to eat. The breakfast menu is wide ranging; from porridge & muesli to homemade fruit scones & croissants. Cooked items included the usual suspects; various types of meat and/or eggs on toast to more interesting and very Scottish sounding dishes like ‘Black pudding with pancakes & mushrooms’ and ‘White pudding with apple, crispy onions & cumberland sauce’. I was tempted by a breakfast special of ‘Tuscan Sausages with spicy beans on toasted sourdough’ but in the end went for ‘The Gandolfi Full Scottish Breakfast’. I was warned it would be around 15 minutes, it was actually more like 25 minutes but luckily we had a couple of hours to kill anyway and it gave me time to flick through the Seumas MacInnes cookbook which was indeed very impressive. 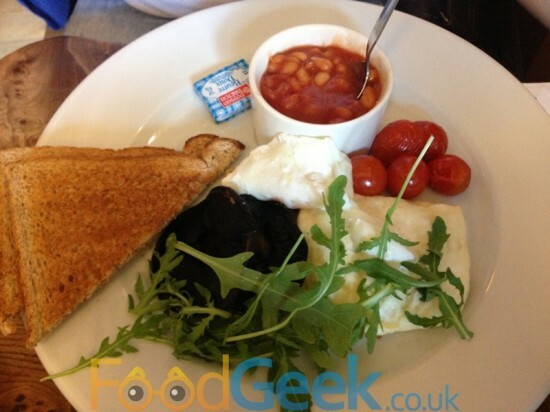 My first impression of the ‘Full Scottish Breakfast’ was that it was a bit small for £9. After eating it though, I realised it was all about the quality of the ingredients rather than the quantity. Other than the ‘potato scone’ – which i’d expected to be homemade and a bit more rustic but turned out to be just a regular flat potato cake out of a packet – every element was of the highest quality. The sausage thick, beefy and tasty, a perfectly poached egg, sweet juicy cherry tomatos. It was really all about the black pudding though which was without doubt the best i’ve ever eaten. My only complaint was the bacon which i felt was slightly underdone and too fatty as a result. I’d forgive anything for that black pudding though. Mrs FoodGeek went for the slightly healthier vegetarian version which swapped the meat for extra mushrooms, beans and a fantastic piece of fried Halloumi, something i’ve never really considered eating with breakfast before but worked brilliantly well. Service was a little slow but it was busy and the staff were all incredibly friendly. My second drink, a pineapple juice took 20minutes to arrive. The waitress apologised saying they’d run out so she’d had to get some from the nearby Bar Gandolfi. I appreciated the effort but unfortunately I’d virtually finished eating by the time it arrived and it was warm. I’d much rather have been told they didn’t have any and chosen something else. Further disappointment came when I tried to order ‘French Toast’ after finishing my breakfast but was told that they stopped serving at 12pm. I’d have been annoyed anyway as it was only around 10 past but even more so because i’d have ordered on time if food & service had been a bit faster. Nevertheless, I had a really good breakfast at Cafe Gandolfi. It’s a nice place with lovely staff and a pleasure to eat somewhere that clearly cares about their ingredients. It was definitely worth the walk and I’ll go back for breakfast again next time i’m in Glasgow. I’ll just make sure I leave enough time to order seconds.